The 1231-11 is a bare board tester that utilizes the full range of Hioki’s in-circuit testing technologies to deliver LSI reliability testing, complex component separation testing, high continuity and insulation testing, and more. The combination of theoretical resistance values generated by SIM-LINE with high-precision, 4-terminal resistance measurement assures pattern reliability. 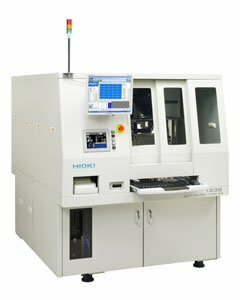 HIOKI delivers testing of embedded passive and active devices that is one step ahead of the competition thanks to measurement expertise developed in connection with its in-circuit testers. The 1232-11 supports thin boards with a thickness of 0.05 mm. Its tension clamps can secure even flexible boards in a stable manner.